Raynes Park Methodist Church was founded in 1914. In its early years the church thrived with a congregation of 600 people, but this steadily declined over the decades to roughly 80 in the mid-90s. Although the Lantern Arts Centre, a theatre and art group, has used the premises for many years and gained publicity for the church, the congregation of the church has continued to dwindle, with its members aging or moving away. Last week, Easter Sunday, the church implemented several large changes to its layout and its style of service in an attempt to make the church more welcoming and attractive to younger people. With the congregation having jumped up from where it previously stood (thirty on a good day), these changes seem to have been a huge success. However, various aspects of these changes – such as the “coffee shop” feel mentioned below – may or may not be permanent, based on how they work out. The church, a Grade II listed building, has a lovely exterior heavily influenced by Byzantine architecture, with circular arches and domes. Although there are some plaques on the walls, the interior is rather plain, directing one’s focus toward the large cross on the wall at the front, behind which large organ pipes can be seen. There is a stage at the front of the church, on which is a projector screen and an electric piano. 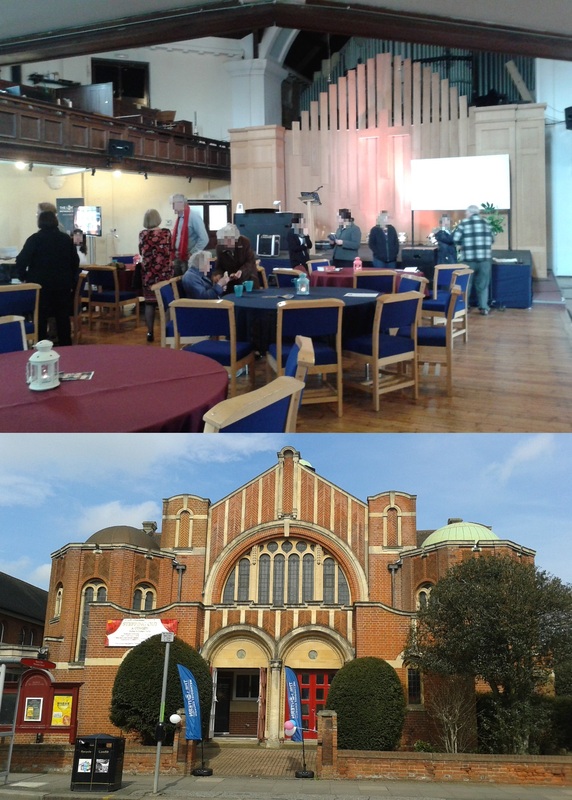 As a result of the church’s new style of worship, the seating is laid out rather differently from any other I’ve visited so far; chairs are set around circular tables at which the congregation are invited to have teas and refreshments served from a table at the back of the church. This gives the church a very friendly, open feel, almost as if the service is taking place in a coffee shop. The service was led by a female minister and a male worship leader, both dressed casually. They both seemed very friendly, with the latter welcoming me to the church and speaking to me afterwards. A gentleman from the congregation came up to give the reading, and a lady with a guitar led the songs. According to the worship leader who I spoke to after the service, the congregation numbered 56 people, several of whose first visit was today or last Sunday. There was a wide range of ages, ranging from the elderly to several probably in their mid- or late-twenties. There were also one or two families with young children. There were more women than men, to a roughly 2:1 ratio, and between a third to a half of the congregation was of an ethnic minority. The service began with a welcome to worship and notices, followed by three songs, the lyrics to which were projected in large font onto the projector screen at the front. The first was a traditional hymn, and the other two were more modern worship songs. After prayers, there then came a short Bible reading, Matthew 6:31-33. This was followed by a talk from a visiting American author, who expounded wonderfully on the reading and went on to speak in detail on God’s love for us and on the topic of spiritual discipline. The talk ended with three questions for discussion, which we were asked to spend a few minutes on our tables considering amongst ourselves. There were then prayers, including the Lord’s Prayer, after which a final song was sung. The minister then dismissed the congregation with a blessing. After the service, most of the congregation stayed in the church for a while to talk and to get more refreshments from the table at the back. Several copies of a new book by the visiting author were available to take from a table by the exit. The church was built in the early twentieth century, with the foundation stone being laid on 22 July 1905 and the church being consecrated by the Bishop of Southwark on 14 July 1906. 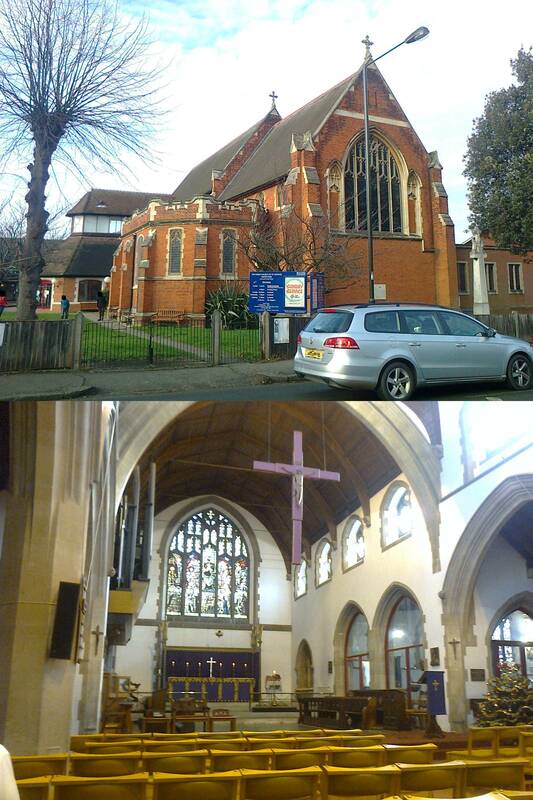 St Saviour’s became the parish church of Raynes Park in May 1907, and significant expansion and refurbishment of the church buldings took place in 1989. Although Anglican, this church contains some features which one would usually expect to see in a Roman Catholic church. Pictures of the stations of the cross are around the walls, a small font of holy water is situated by the entrance for people to bless themselves with upon entering, and there is a statue of the Virgin Mary is at the back of the church. Speaking to a member of the congregation after the service, I was told that many members of the parish consider themselves to be Anglo-Catholic. A large mauve crucifix with a silver Christ hangs down from the ceiling between the nave and the sanctuary area. The altar and lectern were both decorated with purple and gold, which may have been due to it being Advent, purple being the liturgical colour for such in most western liturgical traditions. The altar had a cross placed on it, with three lit candles on either side. Behind the altar is a stained glass window depicting Christ enthroned in heaven, surrounded by angels and saints. Large organ pipes jut out from the left-hand side of the sanctuary area, and due to the time of year there was a Christmas tree placed in the front-right corner of the nave and an advent wreath (somewhat hidden behind a pillar from my point of view) in the front-left corner. The service was taken by two priests, one of whom (the presiding one) was wearing a rose-coloured chasuble. The second gave the gospel reading. There were two men in white cassocks as deacons or altar-servers, and an organist and a (small) choir of two spent the service with them in the sanctuary area. The congregation, including myself, numbered 22, or 30 if counting the eight children, who spent most of the service in their own junior church in the halls. I was one of only six men in the congregation, the great majority of which was comprised of people who would most likely have been over 50. There was also a Barbadian family there who were younger than most of the rest of the congregation, relatives (so I was told – apologies if this is completely false!) of one of the two priests. I found the members of the congregation to be very friendly, with some of those sitting next to me frequently pointing me to where we were on the service sheet, which, while very kind of them, was rather unnecessary. I spoke with some of them after the service. I attended the 9:30 communion service. It followed an order of service found in a booklet handed out upon entry, with readings in a printed service sheet and hymn numbers displayed on the wall. The service started with a hymn, during which those I listed in the “clergy” section processed up the central isle to the sanctuary area. Being the third Sunday in Advent, one of the children then lit three candles on the advent wreath, and the children then left for their junior church, after which there were prayers of confession. The Bible readings followed – Isaiah 61:1-2, 10-11; 1 Thessalonians 5:16-24, and John 1:6-8, 19-28. After the Bible readings came the sermon, delivered by the priest in the rose-coloured chasuble. He spoke about liturgical vestments and on the need to rejoice that Christ has come. Intercessory prayers for the world followed, given by a lady from the congregation and finished by the priest, who included a prayer to the Virgin Mary; this was the first time that I have heard her directly prayed to (as opposed to simply mentioning her interceding in heaven) in an Anglican service. After a second hymn (during which the junior church re-entered the service), communion was taken. After prayers (including the Lord’s Prayer) and a recital of the Nicene Creed (the filioque was included, but italicised in the order of service), the congregation went up to the front to receive communion. They knelt on cushions before a communion rail and received either the bread and wine or a blessing. Two more hymns and some more prayers were said after communion, and the presiding priest then made some announcements. This was followed by the children telling the congregation what they had been doing in church (activities related to the concept of preparing for Christ’s coming), and after a blessing the service came to an end. The service lasted roughly an hour and five minutes. Tea, coffee and biscuits were served in a church hall after the service. I spent a long time talking with several of the friendly congregation members, who told me a lot about the church.